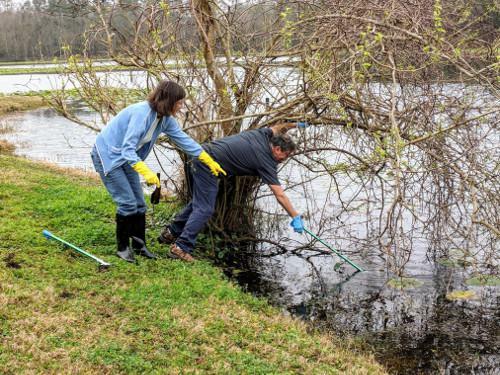 Duval Audubon Society has been very busy this year working to accomplish our mission, Connecting People with Nature. 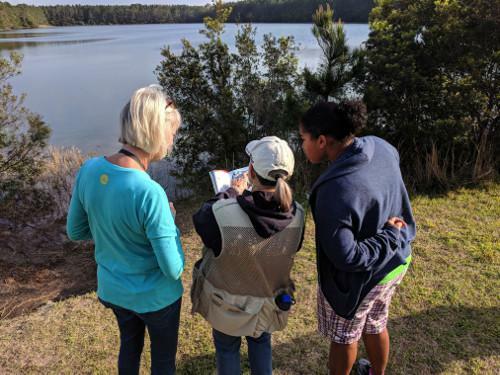 Volunteers led 36 field trips this season at locations as far north as southern Georgia (Harris Neck NWR), as far south as Gainesville (Sweetwater Wetlands Park), and many wonderful birding spots in between. It's been a great birding season, including sightings of over 100 Black Skimmers at the January 2018 Fort Clinch State Park field trip, more than 100 Black-bellied Whistling Ducks at Sweetwater Wetlands in April, and a sighting of the rare White-rumped Sandpiper during our visit to Spoonbill Pond on Big Talbot Island in May. We also participated in Audubon's annual Duval County Christmas Bird Count (CBC) in late December, and our dedicated volunteers recorded 152 different species during the count. Audubon and other organizations use data collected in this long-running wildlife census to assess the health of bird populations, and to help guide conservation action. In conjunction with the "real" CBC, we hosted a CBC4Kids event for the younger set in early January at Camp Chowenwaw Park in Clay County. Thirty kids were treated to bird walks with experienced leaders, and afterwards enjoyed snacks along with a great animal outreach program presented by the W.I.L.D. ambassadors from the Jacksonville Zoo. Many thanks to Wild Birds Unlimited of Julington Creek for sponsoring the snacks and drinks for the children (and the adults) to enjoy! 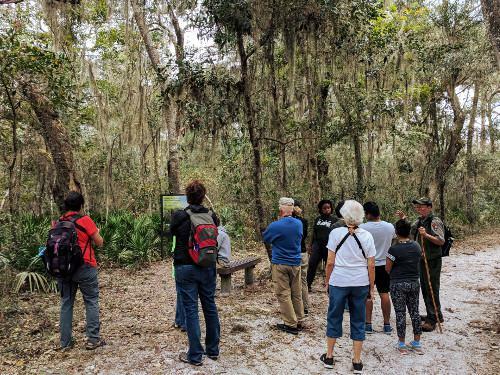 This year we started a new program of Beginning Bird Walks at the Fort Caroline National Monument in partnership with the Timucuan Ecological and Historic Preserve. The walks are on the first Sunday of the month from September through May and introduce participants to using binoculars and recognizing the birds in our area. This program has been a great success for us. We have had 10 to 20 participants at each walk (quite a few are repeat attendees), and several have joined our chapter as a result. We are continuing this program for the 2018-2019 season and hope to build on our current success. In January we began a partnership with St. Johns Riverkeeper and the City of Jacksonville to do monthly Cleanups at parks in the Jacksonville area to help prevent trash from entering our waterways and endangering our beloved birds and other wildlife.Volunteers picked up trash at five local parks, including one of our favorite hidden gems for birders, St. Augustine Road Fish Management Area. UAS2 Drone Photography and Video (https://uas2drones.com/) shot some beautiful footage during our May cleanup at Sheffield Regional Park, which you can find on our YouTube channel at https://www.youtube.com/watch?v=haGcACWIs6k&feature=youtu.be. We continued our Monthly Program Series this year with some fascinating programs, including presentations about giant creatures of Ice Age Florida, birds and seed dispersal, pelagic birds of Florida's northeast coast, and the Florida Grasshopper Sparrow conservation program at White Oak, to name just a few. Next year's programs promise to be equally riveting! Carol Bailey-White (carol.bailey.white@duvalaudubon.org) to sign up as a volunteer. Programs and field trips will resume in September after the summer break. If you are a member of Audubon, look for your flyer in the mail at the end of the summer, and you can also find our events on our Meetup site (https://meetup.com/Duval-Audubon-Society/) and our Facebook page (https://www.facebook.com/DuvalAudubonSociety/). All of Duval Audubon Society's activities are free for anyone to participate, and we hope to see you soon!